This is what we’ll end up with (click the image to see it in full scale). To some, the idea of the business card might seem a little outdated—a remnant from the days when we didn’t have super cool touch screen phones with our super cool digital address books. However, the business card is still a very robust method for getting your name out there. For one thing, it’s much quicker and easier to pull a card out of your pocket than to have someone take out their phone and type out your information on its tiny keys. Secondly, the business card is physical and tactile. It is a tangible reminder the person that hands it out. And finally, a business card has a certain air of professionalism attached to it: The business card shows that you mean—well—business. 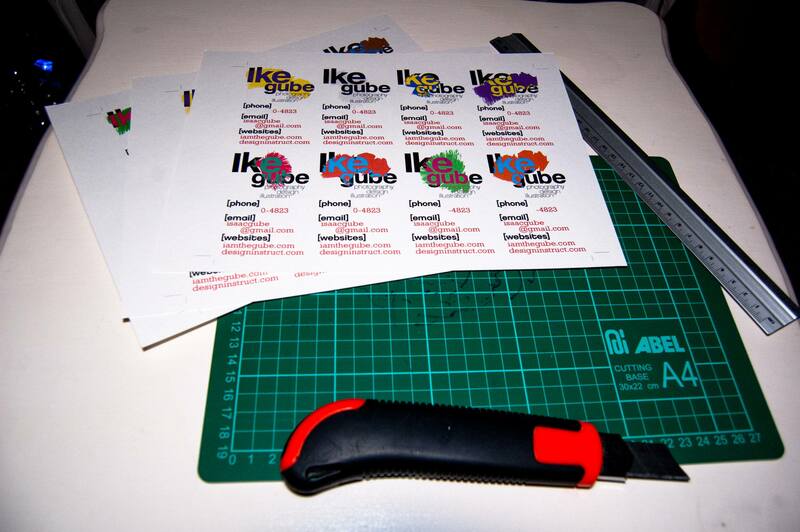 So now that you’ve decided that you need business cards, how do you go about getting some made? Well, there are always printers you can hire to make cards for you. They’ll even design it for you, if you want (which would be ironic if you were a designer). However, the costs can sometimes be prohibitive, especially if you get all sorts of different finishes and treatments for your cards. Then, of course, there’s always the option of having some business cards made online. Some of these services will even do it for free. But you’ll have very little control over how your business cards will look. If you’re on a budget and would still like have great looking business cards, one of the best solutions is to design and print them at home. I’ll walk you through how to make very simple business cards that pay homage to Swiss design. What is Swiss Style design? For those of you not familiar with Swiss Style, also known as the International Typographic Style, it is—at its most basic definition—a style of graphic design that emphasizes readability, cleanliness, and clarity while using typography as main design elements. The Swiss Style emphasizes the notion that "form follows function." And with business cards—whose main function is to give out your contact information to people—readability and clarity are definitely appreciated. You definitely don’t want to lose a client because they couldn’t read your business card. A box cutter (or if you have a photo trimmer or one of those paper cutters, even better. You can fit 8 business cards on a single A4 sheet of paper. 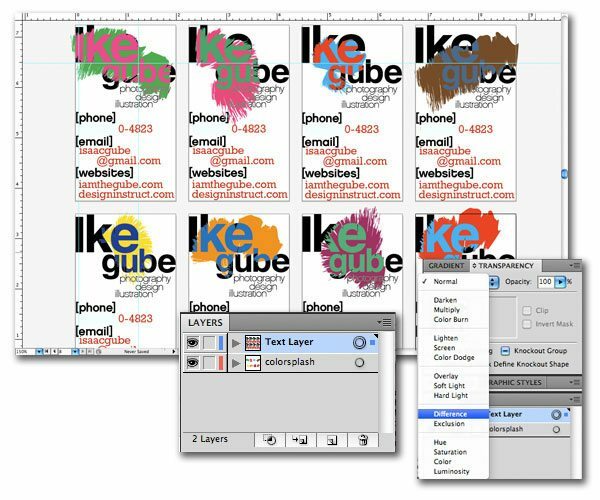 The dimensions of your business card should be 3.5 x 2 inches for a standard size business card. Since this business card is inspired by Swiss design, I knew from the start that I didn’t want to put images on my business card and that I want the design to focus on typography as the main design elements. Helvetica: To keep the design firmly grounded in the Swiss style. One can even say that Helvetica is the epitome of the Swiss Design style with its clean lines and its creator’s intention to make a neutral font. Chalet New York 1980: The Chalet font family is a fairly new collection of fonts released in 2000. It is mostly derived from Akzidenz Grotesk and Helvetica. The result is the more modern and clean look of the Chalet font family. Chalet Paris 1960: With its delicate stroke weight brings a little softness to the design of the card. Rockwell: Gives the design a little bit of a twist. 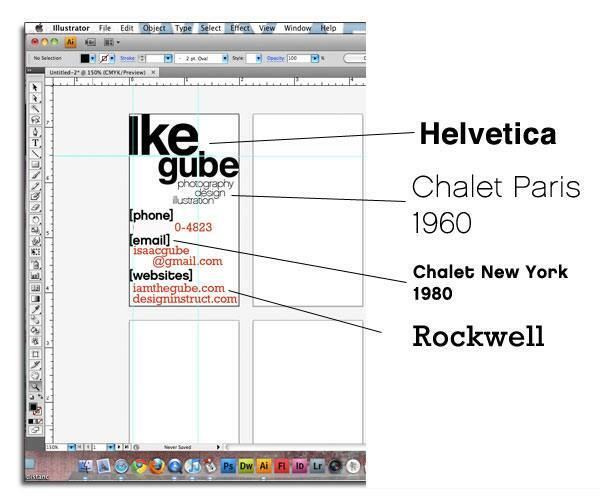 Rockwell isn’t a sans serif font but rather, it is a ‘slab serif’ font. However, in the context of this particular design, Rockwell’s monoweight strokes complement the other sans serif fonts quite nicely. 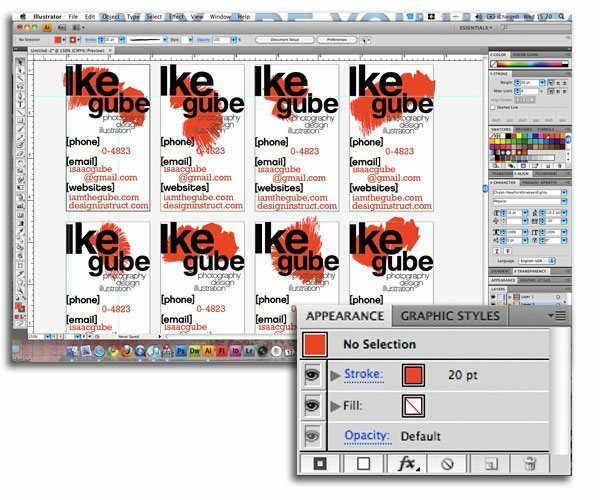 When you’re satisfied with the layout of the business card, you can select all the design elements using the Selection Tool (V) and while everything is selected, press and hold the Alt/Option key on your keyboard to drag out 7 copies of the business card design that you can place in the other art boards. Make sure to align the text properly. You can turn on the Snap to features (View > Snap to Grid and View > Snap to Point) of Illustrator in the View menu to make this easier. Up to this point, I’ve stayed pretty much in the Swiss design mindset. So far, the design is neat, legible, and conveys all the contact information I want people to have. However, Swiss design emerged in the 1950’s. I was born in the mid 80’s and I’m working in 2010. I think it’s time to add some more current design elements. One thing I love about the 80’s is the liberal use of color that emerged from that decade. And one thing I love about current design styles is the resourcefulness of designers who often use design elements in unexpected ways to create something new. So now, I aim to combine these two things by some adding colors to the business cards while using a rather large charcoal brush to apply that color. The charcoal brush has nice jittery edges that will make for interesting results. To do this, create a new layer for the color splash and place it under the layer on which we have all the text. Then, you take the Brush Tool (B) and select a 20pt charcoal brush. Set the fill to None and the Stroke color to the color you want to use. Draw out short, random paths with the Brush Tool to achieve different effects. By having short paths with a large charcoal brush stroke, you can achieve some pretty unexpected results. Play around with it until you’re satisfied. I decided to use a lot of different colors so that I have 8 slightly different business cards that I can give out to people. To change the colors of the splashes, select the path whose color you want to change with the Selection Tool (V) and go to the Appearance Panel. Change the stroke color to whatever color you want. To make things a little more interesting, you can change the blending mode of the text layer to "Difference" in the Transparency Panel. By doing this, you bring out the inverted color of the color splash you just applied to parts of the text. It’s a simple and easy way to add some boldness to your card. 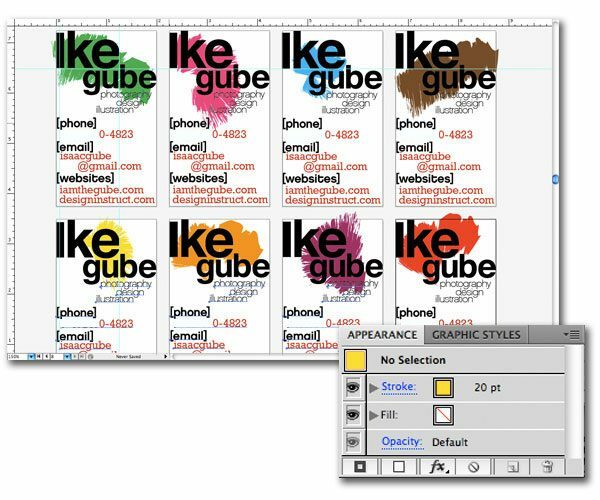 To do this, first select the text layer in your Layers Panel and click on the small circle beside the name of the layer to select all the elements on the layer. Then go to the Transparency Panel and choose Difference. You now have some interesting looking business cards ready for print. To print your business cards, first load up your printer with your card stock. Then go to File > Print (Cmd/Ctrl + P) to open the Print dialog window. 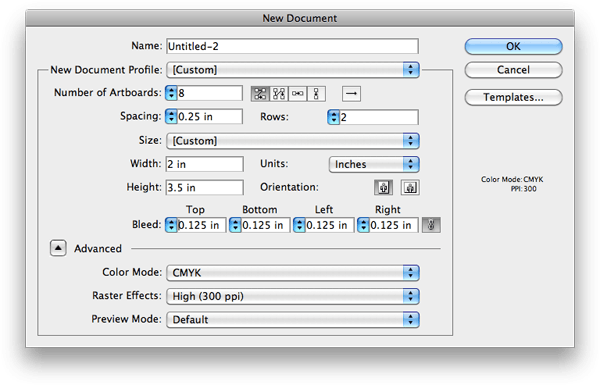 You’ll need to click on the "Ignore Artboards" box and orient the layout to print in Landscape mode. Refer to the image below for guidance. With your business cards printed, take your box cutter and ruler, and cut along the sides. 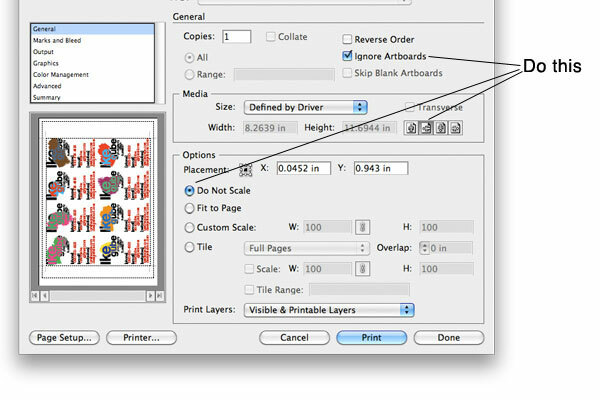 Depending on your card stock thickness, you may have to do this one sheet at a time. This is where a photo trimmer comes in handy as they can allow you to do more sheets at a time as well as make sure that your edges are professionally trimmed. However, by using a box cutter, the edges can have unique nuances that make each business card distinct and personal (or it can make them look unprofessional—so be careful). These are the actual cards I give out to people when I’m doing photography for parties and club events and I’ve gotten some very nice compliments and some very good contacts. Sure, these business cards that we made are very low budget and it’s almost unfair that they are so easy to make. Some people might think that’s a bad thing. However, just keep in mind that while some of your peers might have some super awesome business cards printed on organic paper made from the pulp of extinct trees from the Amazon rainforest, the business cards that you made at home do the exact same thing as theirs. The truth is: Your business card will not help you make a good impression on someone. All a business card can do for you is make it easier for prospective clients and new contacts to get in touch with you when you do make a good impression with your work and your personality. A business card is just a small piece of paper. There was a movie that came out in 2000 called "American Psycho" starring Christian Bale. There was a scene in the movie where Christian Bale’s character had an internal monologue about how envious he was of his colleague’s business card design. In the movie, Christian Bale’s character ends up being crazy. Don’t be like Christian Bale (even though he’s Batman). 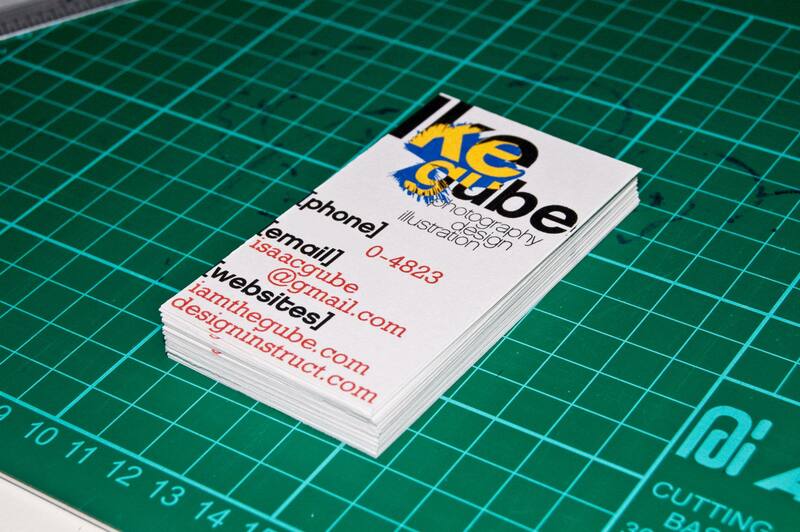 If you’ve created some home-made business cards, share them with us on Design Instruct’s Flickr group pool.